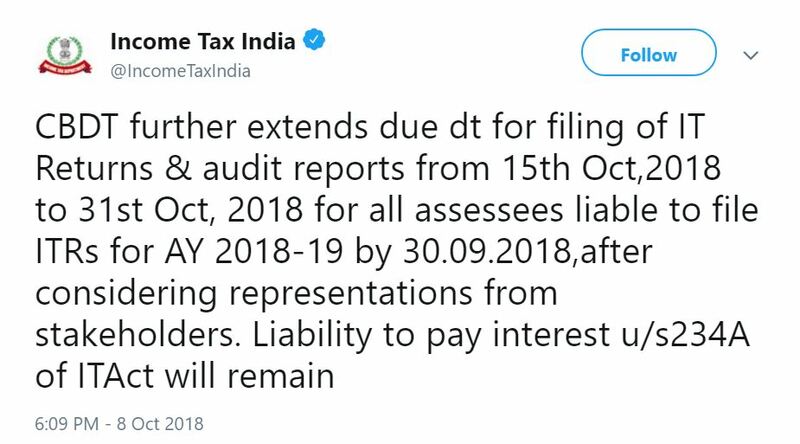 Home / Headlines / BREAKING: CBDT extends due date for filing Income Tax Returns & audit reports to 31st Oct.
Next CA exam postponed, check revised dates. new york personal injury lawyer http://myblog1z.weebly.com/blog/uncovering-clear-cut-programs-for-new-york-accident-hi5-lawyers – Your style is so unique compared to other people I’ve read stuff from. Many thanks for posting when you have the opportunity, Guess I will just book mark this site. I simply want to tell you that I’m very new to blogging and seriously savored you’re blog. Probably I’m going to bookmark your blog . You absolutely have outstanding stories. Kudos for sharing with us your website.